October 27, 2012 Liz F.
Isaiah’s favorite movie is The Polar Express. In fact, it’s really the only thing he’ll watch. I’m pretty sure he’s seen it about 100 times. He watches it about once a day. He has the words, the music, and the actions of every character memorized. So, his ticket punching obsession began innocently with the white paper supply we have in the office, but after a while, the white paper wasn’t good enough. He was like a little addict that needed a hit. He began to punch colored paper. Then, patterned paper. After a while, he was a punching machine–he was punching everything from customer invoices to homework. Finally, he pushed his punching beyond the limits and punched a caricature of our kids that we paid someone to draw. Mark had enough! He was hiding all of the scissors in the house. Isaiah in ticket punching mode. Now, when Mark declared that he was hiding all of the scissors, I was not home. I am not sure if Isaiah was watching Mark hide the scissors or not. All I know is that he began to have ticket punching withdrawals and went searching for his scissors. I was washing the dishes, and I heard a crash in the basement. Not the usual crash, like when a tower of LEGOS falls, but a big crash. I paused and listened for screaming. I heard Isaiah singing, so I knew he was okay. I finished washing the last couple of dishes, dried my hands, and walked towards the noise. Isaiah met me at the top of the stairs with a piece of paper and craft scissors. “Tickets, please!” he said when I saw him. He was as happy as can be. I went down in the basement and searched for the source of the crash. I walked into my office, and the storage closet door was open and a large amount of stuff was spilling into the room. Apparently, Mark hid the scissors in a container on the top shelf of the storage closet. I wish I could properly explain the mess I saw. 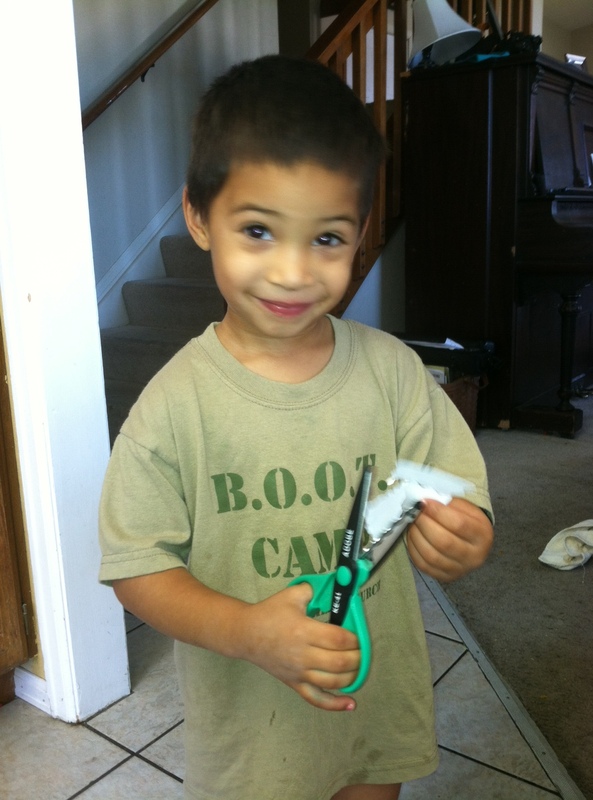 The shelf that held Isaiah’s precious scissors was full of board games, wrapping paper, and dishes. As I assessed the mess, I think that Isaiah decided that the board games and wrapping paper needed to be removed to reach the scissors. (Thankfully, the dishes were on the side that he didn’t climb.) He started pulling games from the bottom of the stack on each shelf, which caused a large amount of games and well-organized gift wrapping supplies to collapse into a huge mess of game pieces onto the floor. He then climbed up the shelf and threw the (nice) container that held his scissors onto the floor from the top. Now, I’m sure there is a lesson to be learned here. Isaiah is pretty resourceful and observant. I think the lesson is that if you are going to hide something from a resourceful, observant kid (even if he seems like an innocent three year old), then don’t hide it by anything that has a ton of small pieces. Or maybe the lesson is to not let your kids memorize The Polar Express. I don’t know. Whatever the lesson is, I am going to spend an inordinate amount of time separating game pieces today. 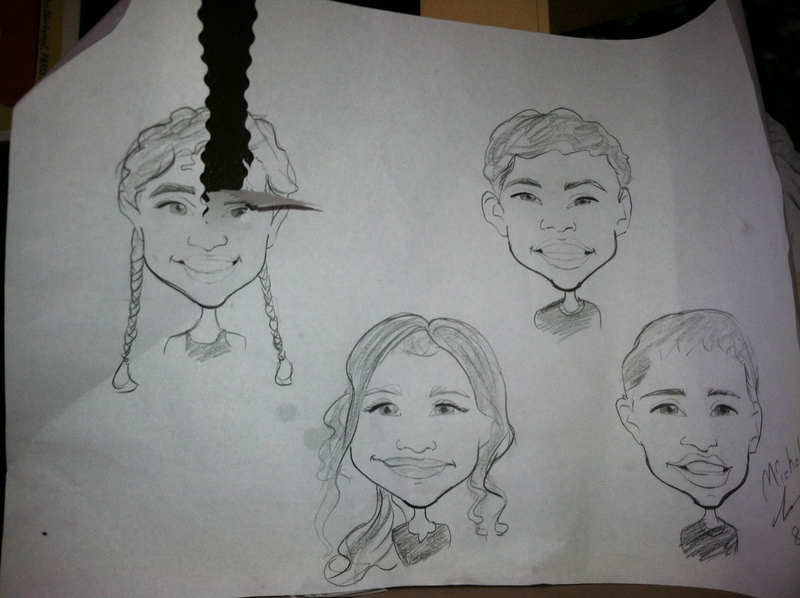 The caricature that fell victim to Isaiah’s punching. This entry was posted in Children, Drama, Messes. Bookmark the permalink.